Very intrigued by this. Looks amazing and would likely make me take the leap to downsize from 60%. Definitely going to get in on this one! I really appreciate the designer's intention to allow the use of standard sets with the TMO-50's layout. That makes this a great option to encourage more people to make the transition to under sixty keyboards. I must own this. I love the layout, gimme! I love this board and I think this will very well be my first <60%! How much extra room do you anticipate inside the case? If I wanted to make my own PCB in the future, for example, would there be any room for a battery, you reckon? Lithium ion, cell battery perhaps? It's pretty tight, I don't think there'd be enough room for any significant battery, unless you milled a custom pocket in the bottom case. This board is made precisely for people that want to go <60% without much compromise! There's almost no extra room inside the case though as it's designed to be as low and compact as possible. Bluetooth is on the to-do list for Round 2 if first round takes off though! It's in progress actually and I'll have some factory samples mid of June hopefully. Still have time to save up on this! Thanks! Stay tuned for couple of weeks and factory samples are about be ordered. First of all, the official name is being changed to TMO50 instead of TMO-50. A small change but think it's a bit more compact and the dash was unneeded. I changed the exploded view in OP so check that out for bit more details of each part. Also let me know if you like that case colour! Really nice about the soon running GB! Would it possible to get the PCB files? I changed the exploded view in OP so check that out for bit more details of each part. Also let me know if you like that case color! The beige render's color is my preferred one. Are the leds going to be programable? They would be very useful as layers indicators. Thanks for the info, will keep that in mind. Just experimenting with some colours. Yeah, indicator LEDs are programmable but they're 2×3×4(5? )mm THT leds. They're basically there because of layer indication. It's not like this board with have "lock" keys. Sorry but why? Don't want to come of as rude but even though I value OS projects, TMO50 isn't one of them. As it's a custom layout with everything done by scratch I don't feel comfortable with sharing these files. Especially before a GB that's on its way. QMK's ACTION_LAYER_TOGGLE(layer) may provide layer locking, right? It may work great along with LED's. I‘m incredibly sorry if this question came across rude and made it seem as if I didn‘t want to support you and your design. To clarify: If the situation (money etc.) is right when the GB is running, I will totally join in! 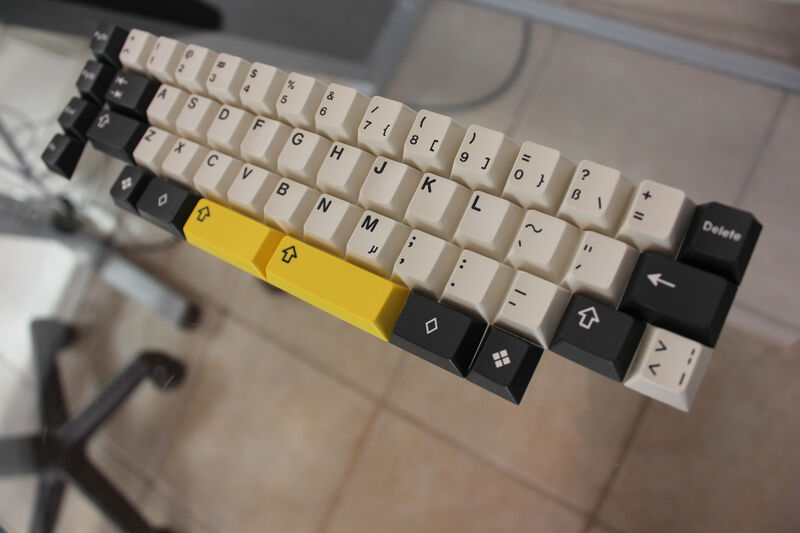 The question came up in a discussion with a friend when talking about what kind of projects with customized keyboards would be cool (an the fact that his school seems to have, for lack of a better word, a „machine“ with which you can theoretically assemble and produce PCBs). I posted it without thinking twice about it being inappropriate when the GB didn‘t even run yet. I know that some people in the community have a weird entitlement attitude and I myself find it often annoying. Even though I acted the same with my question, I want you to know that it was not my intention and I really appreciate the time and work you put into this awesome design! A gentleman's answer. Mine would be a simple no. An OG XT and DE alphas combo on the TMO50 layout. The top row is R1, because the letters can easily be typed on by touch; while the symbols are not that easy. The DE set has three symbols per key, making it more efficient for this small footprint. What do you think? I really like this design. It have a full alpha area which is great! Would buy when it's available! Registered specifically to watch this thread. It's a special layout, very interesting! I hope it's pink! No problem man. It sounds like your friend is going to one heck of a cool school! :) I appreciate you giving me a detailed answer and wish you the best with trying the "machine" out. 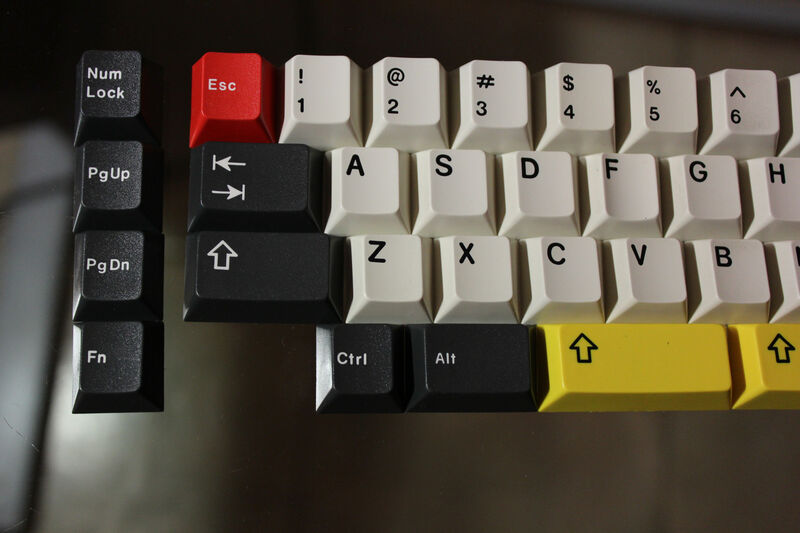 There's a bunch of OS keyboard projects out there now that customs are not only for the wealthy (probably now a lot of these :D) but also super minimal and low-cost ones. Some of which I used to understand PCB designs better. You can ai03's repos as well RealLaugh's mentioned GH60, Toad and there's definitely some others. Do check the "Building Things Together" part of GH too! Haha, it's an honour to be in the spotlight for you. GH has a great community btw so if you're really into mechanical keyboards, there's a lot of interesting threads here. Do follow TMO50 thread though as I'm hoping that GB could happen in about two/three weeks time. I think the upcoming GMK Space Cadet is a great pair with this board, how about you all? I think some thick PBTs would be fun with this one. I'm really excited to hear what it'd sound like in such a small case! QMX guys: Could Alt Gr behavoir, ala US-Int, be implemented? Is there a programming example available? Or, is it just another layer? Cannot wait for this to be under my fingers. Thankyou Sir Burker for sharing this nice project with the community. You have the stagger for rows 2 and 3 swapped. It's a 0.25u stagger for r2 and a 0.5 stagger for r3, like on a normal layout. 1.Regular (0.25u / 0.5u) stagger but for Ctrl/Enter you'd need to get 40% kit for right profiles (base kit would be 1.75u R3 CapsLock + 1.25u R4 Modifier). 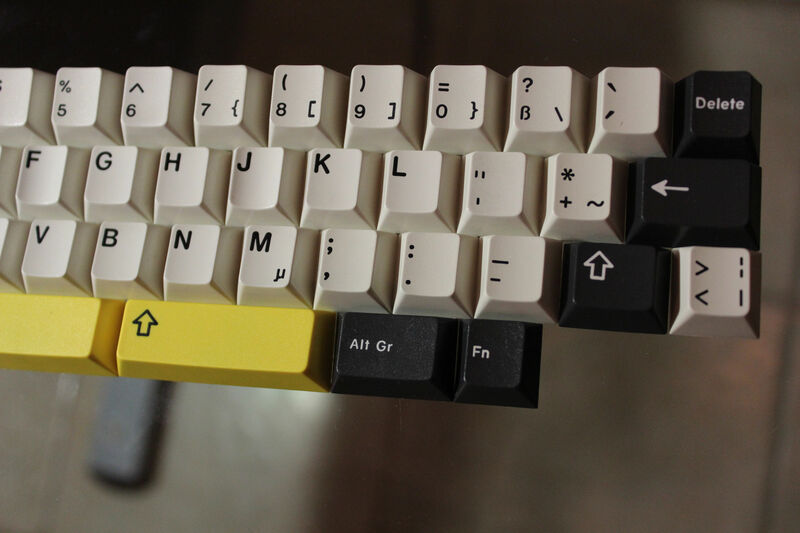 2.Small (0.25u / 0.25u) stagger but Ctrl/Enter can be R2 Tab & \| keys so there's a slight profile difference but layout is completely base kit compatible." I do not want to be limited to forty kits. is there any information about the available colors yet? I'll put those up in about a week. Four colours. Four colors! Wow! One more good point for the designer. Wow this set looks great on this board! I'm seriously sooooo excited for this board to become a reality. I have so many fun things I want to do with it! +1 on the pink colour request! Right?! I thought I was content with my one 40% board but then I saw this one. TMO50 has just the right amount of keys on the nicest layout with obliged blockers and a functional column. None less, it has the option for just standard keys. Right! no need for obfuscating forty sets. Insanely well thought! Stop the hype and embrace the reality. Let the forties being display items and begin using this sub-sixty a daily driver. It's been kept on the down-low for a while now but I've been chatting with a group of testers and we've organized a small batch of case/plate samples from the factory I'm planning to use. The production process is starting tomorrow and is around three weeks. Once testers receive their keyboards and do some testing (quality control etc.) I'm making a GB thread with all the details. So that means GB could start beginning of July unfortunately instead of mid June. For now I've decided to go for 4 colours. These 4 are FINAL. Maybe 5. What do you guys think of military/olive green? Also I have a question related to plate colours. I had an idea about doing darker/lighter plate colour than the case but not doing the same colour for both parts. What do you guys think? I would love to see a military green/ olive. Heck yeah that pink RULES. I like the idea of a lighter colour for the plate, that vibrant pink with a more pastel/pale pink plate would be cute as hell - likewise for the blue. Right? Also a dark gray plate for a silver board would look nice. I just like when a board has some contrast between the plate and case. At first I was into the render board also and I still am but unfortunately white and really light colours are hard to do with anodization and the factory only offers anodization. MAO would allow doing white boards but that's not an option right now. I'm not complaining.. the layout is by far the biggest selling point for me. that said, I have a little buyers remorse for not grabbing the M60 in sage green so this could be my redemption. Whatever you decide is going to be awesome though... it's your baby! What would look good with DSA Milkshake? silver or gray then? If green gets enough traction it's in. Basically I'm willing to do 5 colours max but 4 colours are certainly going to happen. Speaking of DSA Milkshake, it's hard to say. I might be in for some green as well, as long as it's a light green. Personally not a fan of the pink and blue, silver and grey are the obvious for slightly boring color options (both needed though imho). Get both colors. Even better, get all of them and try them for yourself.